As we speak I am currently in Ibiza with the lovely River Island and Grazia team – and we are back to the subject I dread the most when it comes to a holiday, the packing. When that said, as I have been travelling so much recently, I am definitely getting more pro at it – finding myself creating actual outfits, and detecting certain classic outfit essentials that always work. Here are some of my must-haves that joined me on this trip. When on holiday, its all about getting as much as you can out of your holiday wardrobe, with versatile pieces which work both day and night. This super pretty and luxe boho embroidered top, will look just as chic during the day with some cut-off denim, as well as with a black leather skirt in the evening with some strappy heels. I love anything metallic, and these lightweight electric blue shades are a definite winner for an easy-to-wear accessory to update your look. The round shape is not a style I have worn much in the past, but I really love the clean and minimal style of these ones – the perfect style for the summer. When in doubt, I always reach for my black bikini, and my bandeau top in particular – which is a must-have on all my summer holidays. I love to mix and match when it comes to my bikinis, and this one looks great with all my colorful bottoms and is just so easy to play around with. I am all about denim when it comes to summer holidays, and more often than not, my luggage is crammed to the brim with cut-offs, skirts, dresses, shirts… As much as I love the classic blue – I am also a big fan of white denim – which again, is the perfect component for both day-time and evening wear. These ripped shorts ticks all the right boxes. I have a bit of an addiction with perfumes, and my latest obsession belongs to this New York/Scandi brand – which probably wins the price for the best perfume packaging I have come across, as well as brand story. This unisex perfume was created for the perfumers wife (Polly) – it is a fragrant brew for two: lovers can and recall each other, so even with distance they’re never apart. I mean, come on. 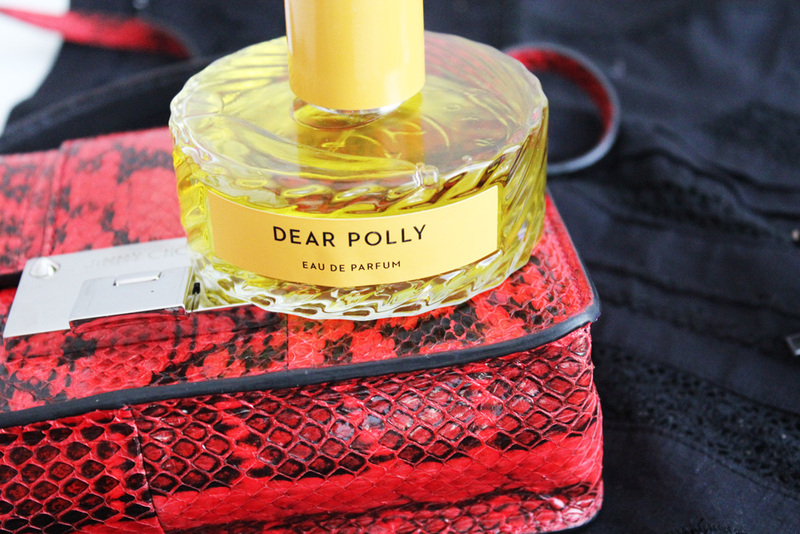 A mix of black tea, musk, apple and bergamot – its light, re-freshing, yet sensual. I am a sucker for anything personalised and this passport cover – a Christmas present from my husband – was the first thing I had personalized with my new initials, so needless to say its a travel essentials on all my holidays. 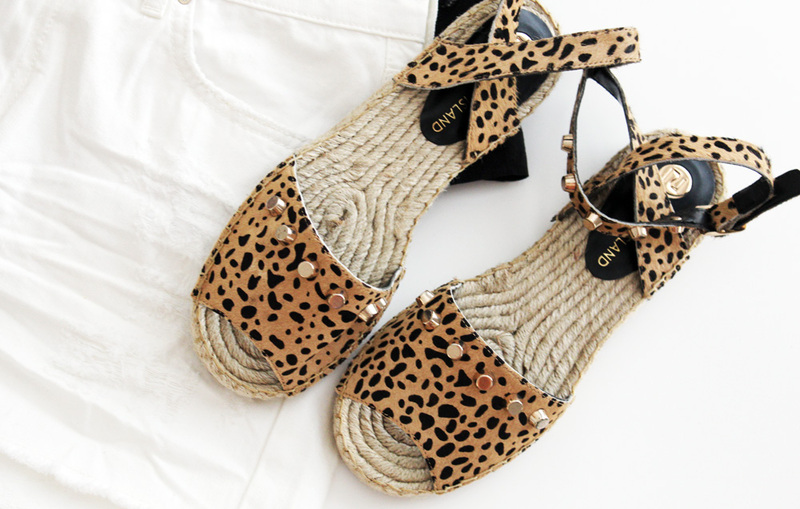 Lets face it – it was love at first sight when I spotted these limited edition leopard printed pony skin espadrilles. They slotted straight into my core summer staples of simple monochrome blouses and denim, and adds that edge to an otherwise clean outfit. I scored this amazing red snakeskin printed mini bag from a sample sale last week, and I could not be more happy with my purchase. Its definitely a statement style, yet the red and the animal print is classic – and the shape is ideal for holiday and nights out. Gone are the days of sun oil and low sun factor. I only ever use SPF50 on my face now – and the key is finding a lightweight version which doesn’t clog your pores, create that ghost-face look and leave your skin greasy. So far I am loving IOMAs Cell Protector SPF50, which absorbs so easily and leaves my skin so soft and smooth. Its just as crucial – if not more – to have multi-purpose beauty products when on holiday, and one of my current go-tos is this hair & body oil – which is the ideal remedy for frizzy hair, hydrate your scalp, any sun damage or sensitive skin. This botanical blend, with a mix of baobab, shea oil, olive, castor and karanja, also leaves my skin nourished and so fresh. I now don’t go anywhere without it. My camera never leaves my sight, and my new PEN camera now comes with me wherever I go; it looks good, it shoots amazing photos and it links straight up to my iPhone – what more do you need? The best investment, ever. Make sure you follow all my live holiday action via Instagram! That blouse is perfect! I have so many of these types of blouses in white but a black one would be great to change it up. Hope you have fun on Holiday. Thanks Jane – I do too, so I thought the black would be a bit different!